THINK of cheerleading and what comes to mind? Young American girls with short skirts, clutching pom-poms whilst jumping up and down? Well it may come us a surprise then to learn the art of competitive cheerleading is nothing like that and is, in fact, nearer to the sport of gymnastics. 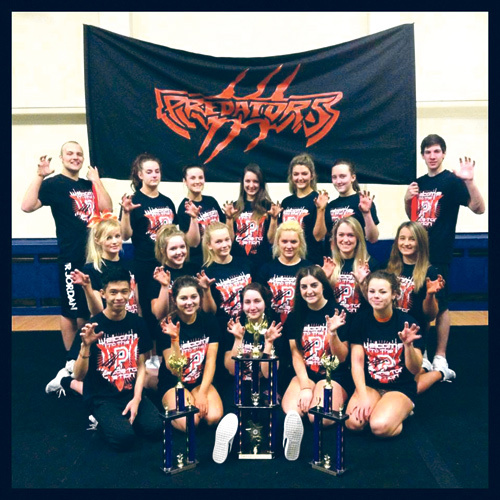 And making waves in the world of cheerleading, is Downend-born Becky Hopton who runs the successful Bristol-based Predators. Many of its members, who range in age from age three to 25 and include both males and females, come from Downend, Emersons Green and Winterbourne but others come from across the city, even from as far as Chew Valley. Becky, a former pupil of Bromley Heath Primary School and Downend School, set up the non-profit making organisation two years ago and is head coach there. 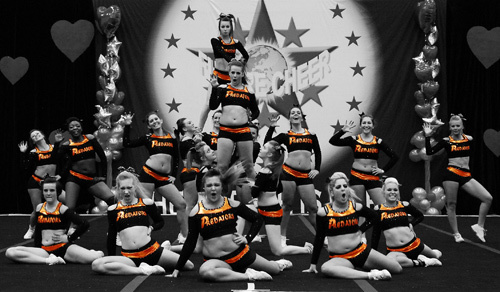 She said: “Cheerleading has been around in the UK for about 30 years. There are a lot of misconceptions about cheerleading; it’s often thought of as girls wearing a small amount of clothes and dancing around. The 23-year-old, who represents Team England in cheerleading, started off as a gymnast but as decided to transfer to a ‘more fun’ sport. A year after bagging a first in her sports education degree, Becky set up her own cheerleading programme and the Predators was born. 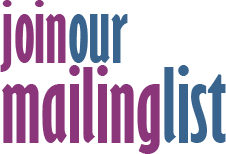 There are various teams catering for different abilities and age groups, including the Pups (up to age five), Cubs (up to age eight), Huskies (up to age 14), Leopards (up to age 14), Venom (age 15 plus), and higher level senior teams, Vipers and Cobras. Classes take place at Fromeside Gymnastics Club in Winterbourne and The Greenaway Centre in Southmead. Skills range from forward and backward rolls for tots to the more complex handsprings and acrobatic stunts like the basket toss, where a member – or flyer - is thrown 10ft in the air whilst performing special jumps. Talent is quickly recognised and the Predators hold regular ‘try outs’ for members who have the necessary skills to move up through the ranks. Becky is certainly an inspiration to her members as she, along with fellow Predator Lily Roberts, will be representing her country at the end of April when Team England completes at the World Cheerleading Championships in Florida. Becky said she has been staggered by how quickly the Predators are sweeping the boards at prestigious competitions across the country, including jaw-dropping wins at the recent Future Cheer Heart of England competition in Birmingham. The next big competition takes place this weekend (March 29-30) when four of the teams take part in the ICC Cheerleading Nationals at Nottingham Arena. “We have a lot of talented athletes and are privileged to have really experienced coaches; with this recipe we have ended up with a fantastic programme,” Becky said. * The next try out takes place on May 17 at Fromeside Gymnastics Club from 7.30-8.30pm and is for the senior Level 2 (age 15 plus) and junior Level 2 (age 9-14) teams. If younger children would like to join they can attend a ‘pay as you go’ class on Sundays at the same venue from 5-6pm, at the cost of £5. There is no need to book or tryout.